Burning the candle at both ends might seem like it’s allowing you to be more productive, but usually it’s a very ineffective way to live. When you’re not getting enough sleep, you’re not able to be at the top of your game. 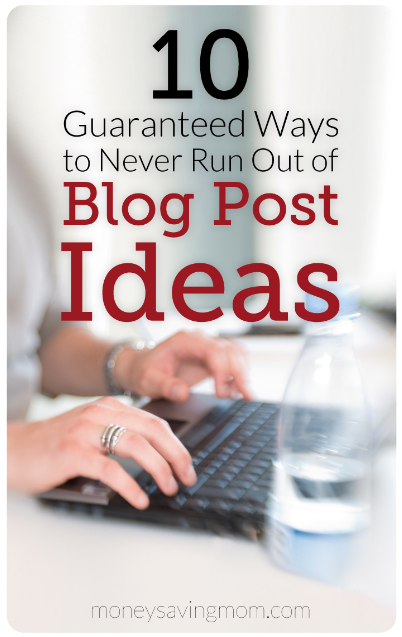 As a result, you’re often not as inspired or creative — especially when it comes to blogging. Case in point, not too long ago, I went for almost a week with zero inspiration to blog. I’d sit down to write and I felt like I had nothing to say. I had a lot of things I wanted to write and many different post ideas, but no desire to actually write the posts. This is very out of character and I began to wonder what was wrong with me. Was I depressed? Was I just plain out of inspiration? Did I need to get my levels checked at doctor? I ran through just about every possible issue in my brain for a few days trying to figure out what could be wrong with me — and I kept coming up dry. Finally, one night I got a really good night’s rest. And guess what? The next morning I was all inspired to write again! I wasn’t depressed nor was there anything medically wrong with me; I was just tired. Without really even realizing it, I’d fallen behind on sleep — and it had caught up with me and sucked all the inspiration from me. The best way to guarantee that you get more sleep is to get to bed earlier. I know that night owls often despise this sort of advice, but whether you are a night owl or a morning person, you need to consider whether or not you’re getting enough sleep. Feeling exhausted when you wake up in the morning? Struggling to keep your eyes open after lunch? Hitting a productivity wall in the middle of the afternoon because you are feeling tired? If any of these things are routinely happening to you, there’s a very good chance that you’re not getting enough sleep at night. Training yourself to get to bed earlier so you can get a better night’s sleep can be hard. Find an accountability partner who will commit to earlier bedtimes with you (if you’re married, it’s fantastic if that accountability partner can be your spouse!) and then challenge yourself to stick with a realistic earlier bedtime for at least three weeks. Notice I said “realistic”? That’s really important. If you usually go to bed at 1 a.m., don’t try to all of a sudden change to a 9 p.m. bedtime. Try slowly moving your bedtime by 30 minutes (or even 15 minutes) every few weeks until you hit on a time that works best for your body and your family’s routine. Wind Down Early – Start getting ready for bed at least an hour before your bedtime. This way, you’re helping your body to start winding down well before you need to be dozing off. Turn Off the Electronics — Seriously, stop checking your email or social media in bed. The world (and you!) will survive just fine. And I promise you won’t get sucked into 30 minutes or an hour of mindless internet-hopping. Follow an Evening Routine — Go to bed near the same time every night, if at all possible. The more you can get your body into a rhythm, the better you’ll likely sleep at night. Prep the Environment — You might find that drinking a cup of Sleepytime tea, using essential oils, listening to relaxing music, reading, and/or Sleep Balm can help to enhance your sleep. Also, be sure to have a dark room, a comfortable temperature, and maybe even white noise. If you’re having trouble actually getting to sleep, force yourself to focus on something simple like counting all the blessings you can think of. Or going through the steps of some certain task. Don’t let your mind wander to things that will excite you or camp on things that might worry you. For more ideas and suggestions, check out the book, Sleep: It Does a Family Good. You aren’t going to be able to get a good night’s rest every night. If you have a lot on your plate right now and there’s not much you can delete or delegate, sometimes you just have to power through and do the best you can do. If you have insomnia, a newborn, a child with sickness or special needs, or other circumstances that are preventing you from regularly getting at least 7 hours of sleep at night, don’t let yourself feel frustrated. Sometimes the best lessons in life are learned from those really stretching, hard, difficult seasons. As C.S. Lewis so aptly said, “Hardships often prepare ordinary people for an extraordinary destiny.” So if you’re in one of those trying seasons, don’t give up. Get as much sleep as you can and press on — knowing that this difficult time won’t last for forever! What tips & tricks help you get a great night’s sleep? I’d love to hear! Hi Crystal! When I was a kid in grade school, my teacher told us that sleep before midnight is what makes you feel rested. I think his premise was that sleep before midnight is when your body rests, and sleep after midnight is when your body recharges for the next day. I have no idea if there is any scientific fact associated with that. It could totally be an old wives’ tale. Nevertheless, even if it’s just because I drank the proverbial Kool-Aid, it works for me! I have noticed for years that if I get plenty of sleep before midnight, I feel rested the next day. However, if I don’t sleep before midnight, I’ll still feel charged up for the next day when I wake up, but I won’t feel rested. Even if I get a full 8 hrs’ sleep after midnight, I still won’t feel rested–just charged up. Who knows? Maybe it’s all in my head, or in my biological clock. 🙂 But it really does seem to work! My husband falls asleep right after caffeine too! of course he has ADHD and that is a classic symptom with them, anything that stimulates a non-adhd person relaxes a person with ADHD. I on the other had have to cut out caffeine by 2pm in order to get a good nights rest. Good sleep is huge for writing with me. I once had a review due that had to be written and posted on a day after a poor nights rest and I could not believe how much longer it took me and how many times I had to edit it over and over just to get it to sound okay. Yet on a full nights sleep that same review would have taken me 1/2 the time. I read this article about sleep habits over the weekend. They found that night owls had a shift in their circadian clocks to more closely reflect early risers after a week of camping. The takeaway is that people can change their sleep habits and that all of the technology and artificial light can negatively impact your sleep. These are all great points, particularly the turning off social media and electronics. I started doing that at the beginning of the summer and instead of playing Candy Crush until I’m tired, I read. It’s made a huge difference in my quality of sleep. Having a good night’s rest not only makes me more creative and productive, but it also helps ward off anxiety and feeling stressed that I won’t be able to tackle everything I need to. It gives me the ability to think clearly, prioritize and speak a little more kindly to myself. I also find that if I’m anxious and stressed about everything I have to do, I’ll just brain dump and write everything down. Then I don’t have to toss and turn at night trying to remember. It really helps me go to sleep! Interesting tips! I would need to incorporate turning off all electronics sometime before bed. My tendency is to be online till the last minute or reading a book on e-reader or something. Maybe to add, what happens during the day also affects the quality of sleep, I have found that exercise, some yoga and meditation during the day improves the quality of sleep when night-time rolls around. Additionally, writing! I think when one writes they tend to crystallize any thoughts disturbing the peace of their minds thereby lending the brain a restful state necessary for a good-nights sleep! Under “plan ahead for great sleep,” I would add the suggestion of getting enough exercise. I definately sleep more soundly and wake up feeling well rested when I get a reasonable amount of physical activity in during the day. Growing up it always took me about an hour to fall asleep. When I went to college I found myself falling asleep in about five minutes. Couldn’t figure out why things changed until one of my classes had a section on “sleep hygiene” in which it explained that your bed should only be for sleep. In college I slept on a sleeping porch which was kept dark at all times and in which all anyone did was sleep. (I lived in a large girls’ house like a sorority). Growing up I spent hours reading in bed. I’ve followed the “sleep only” rule ever since college and still usually am asleep within 5 minutes. Also do all the other things such as “winding down” before bed and following the same routine. Very thankful for learning these tips early as we all need good sleep! I want to do this, but I really struggle with it. My husband works the 3pm -12am shift, so he gets home about 12:30. If I’m already in bed and asleep, I usually wake up to him coming in the door, and have a hard time falling back asleep. If I wait up, then I have no problem falling asleep, but am exhausted by the time he gets home. We’re still working on a sleep schedule that fits! Hyland produces a sleep aid product called Calms Forte. It’s non-addictive. Our family has been using it for a few months and it really helps! This can be purchased off Amazon or even from Walmart. Our local grocery store even carries it. It’s modestly priced; definitely worth a try for $4ish. I aim for 10 pm, but it’s usually 10:30. I’m really trying to be better about a night routine. Shutting off the electronics has been a huge help, including the computer monitor. I’ve been reading with my girls before bedtime, and it’s been great bonding time, snuggle time, and relaxation time. The other key for me is getting up at the same time consistently…weekday or weekend. That’s a really hard one. But if I don’t, come Monday morning, I pay dearly! I loved this post. It’s so true! I say no to a lot of things for sleep. It’s one of my no-budge items except for rare occasions. I really, really like the quote you included at the end. My trick for getting a good night’s sleep is a consistent bed routine and planning out my next day. If I’ve written out any tasks, reminders or other info I don’t need to keep it in my head and worry about it all night. It will be right there for me when I get up the next morning. My sleep schedule….it’s a wreck! Just woke up from working last night, 7p-7a (more like 7p-8:30a), slept from 10:30 to 2:15 this afternoon. Then I’ll sleep “normal” tonight (hopefully, 10 or 11 to early morning.) But I have the issue of waking up in the middle of my nights off, from like 2 or 3 to 5 a.m. Then I’m tired, so even on my days off I have to take a nap, then the cycle continues. I have a difficult time feeling rested, productive. Don’t feel “human” half the time. Not sure how this schedule will work out when my farmer husband and I have children.